Buss Bar: Yes x 2 (Earth & neutral). Meter: Digital volts amps and frequency. Includes lockout control and reverse polarity indicator. Indicatevoltage requirements in option box below when ordering. 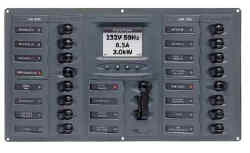 Circuit breakerratings indicated are for 230V and are adjusted if 110V is requested.All digital and analogue panels are supplied with transducers.